Daniel Saponaro, owner of the women’s clothing company Hutch, has always loved the Brooklyn apartment he shares with his husband Kyle Hutchison, a senior vice president at a higher education consulting firm. They enjoy the ideal location, the 1,050 square feet (palatial by New York City standards) and the beautiful tree-lined street. For the past nine years, Daniel knew he wanted to refresh the space, and kept the ideas tucked in the back of his mind. 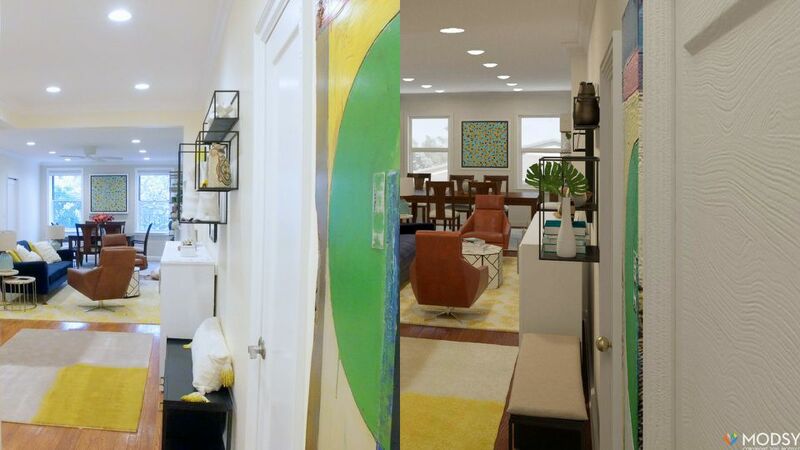 Before the makeover, Daniel could envision “calm, clean lines, pops of white and color” and a “modern feel with a homestyle comfort.” As a visual person, he was able to see the layout and décor, but his husband was struggling with picturing the final product. That’s when Daniel turned to a web-based modeling service called Modsy which helped the couple visualize and style the space. They create 3D renderings of a space that end up looking nearly identical to the completed renovations (as seen here). Luckily, when Daniel and Kyle set out to remodel their apartment, they were working with good bones. The building was built in 1932 using repurposed brick from the original Waldorf Astoria hotel. Since their apartment was so “well-maintained” and had a “rich history” as Daniel says, they made it a goal to modernize the apartment. The couple sought to overhaul the apartment’s dated, pre-war features, such as the molding around the doors that had been covered with countless coats of paint, old-fashioned archways, a lack of overhead lighting and walls that prevented an open layout. After renovating an astounding 80% of the apartment, it’s light, fresh and airy. Several of the walls were torn down and the original doors were replaced. Doorframes and moldings were kept, going through a week-long treatment that stripped all of the layers of paint down to the original metal, which had been oxidized, creating an eye-catching marbled look. The natural light was maximized with overhead recessed lights. The floors were stripped down and now feature a stain that complements the new cabinetry. And the layout was completely changed, opening up the kitchen to allow for an island with seating. The process took around two months, and today, the two couldn’t be happier with the result. Daniel says, “I wanted to make sure the apartment felt new, modern, clean, crisp, accessible, bright and good for entertaining. I believe we achieved it.” And achieved it they did, with a new dining area that’s perfect for fun gatherings. A classic walnut table brings depth to the breezy space, complete with vibrant decorative items that act as conversation pieces. 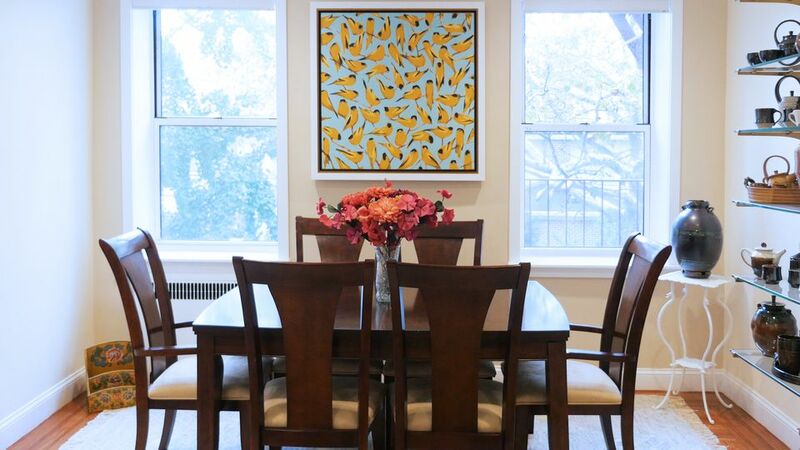 The Joseph Bradley artwork dotted with joyful yellow finches acts as a decorative anchor. The couple even turned to their kitchen as an opportunity to show off some personality, with artistic décor pieces resting on chic shelving. The Anthropologie Wishbone Brackets bring a hint of character to otherwise standard shelves. A sense of playfulness is experienced through these pieces of art, like the delightful chicken artwork created by Trevor Mikula. The apartment flawlessly brings together eclectic styling. Midcentury details live comfortably beside the trends of today, which can be witnessed here in these Pottery Barn Cube Display Shelves. The white walls and light-colored furnishings put the spotlight on the cheerful décor and artistic objects. The centerpiece of Daniel and Kyle’s apartment is undoubtedly their many art collections. Since the makeover, the open floorplan and neutral palette naturally invite color and creativity to be splashed across the walls. He adds that when renovating the apartment, one of his top goals was to be able to display his extensive collection of over 25 teapot sets created by the potter Darin R. Gehrke. “We’ve been collecting his work for about 10 years, and I believe I have the largest collection of his teapot sets,” Daniel says. The pieces are artfully displayed on Restoration Hardware’s 1930’s French Bistro Shelving alongside a jovial piece of wall art crafted by Keith Grace.